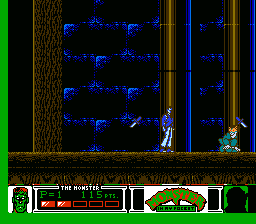 I'm kicking off this themed week (games where you play as the monster), with a trip of nostalgia. Not just for the game itself, but for the explosive trend that was the toy line this licensed game is based upon. I had previously mentioned that my best friend and I were huge fans of all things horror, and that included all of the gross, weird, and creepy toys released in the late 80s and early 90s. 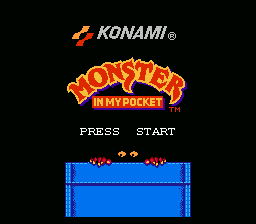 Monster in my Pocket was probably one of the biggest of these fads, for us. It was a series of miniature figures that represented monsters from folklore and horror stories around the world. 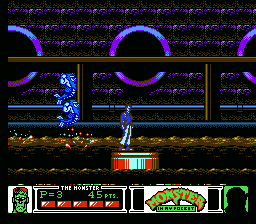 Each monster had a point value, with the higher point values usually falling on the more iconic monsters. These were "rare" monsters that came one per semi-blind box, and were hidden from view- where the others could usually be seen to a degree. 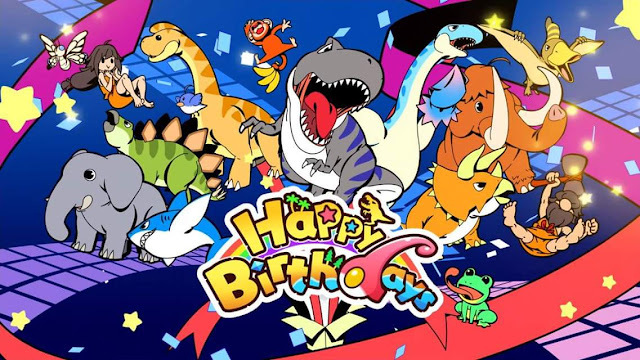 To increase the collectibility, each individual monster (of which there were 48), came in four different colors- red, yellow, green, and purple. So, you might get that werewolf you really wanted, but it might have been red when you wanted green! It was all a lot of fun, and there were comics, cards, and this game. This key. This key defied all video game logic and almost turned this review into a series of game over screenshots and a complaint about making a game that was nigh impossible to get out of the first level. Why? Because my adult brain with thirty years of video game experience had decided 100% that I MUST carry this key with me to the end of the level to unlock a door so that I could progress. Nope. It's a comical prop that can be used as a horrible, short-range projectile weapon. It inhibits your movement, is hard to utilize well, falls from your hands when you're hit, and disappears when it goes off screen- sometimes, at least. Those last two were the biggest causes of my frustration, and coupled with the inability to go back to the left, I rage quit a few times before finally figuring out the essential piece of information I already imparted you with- you don't need it. So, on to the rest of the game, now that I could actually focus on that instead of failing to navigate hordes of tiny monsters while holding this damn thing, or even throwing it to my advantage while I destroyed everything around me with punches. You can choose between the Vampire and the (Frankenstein's) Monster. There's no discernible difference that I found, so choose whomever you want. Controls are straight forward- "A" to jump, double tap "A" to double jump, "B" to punch, start pauses the game. If you so choose to waste your time picking up an object, press down + "B", then "B" again to throw the object. 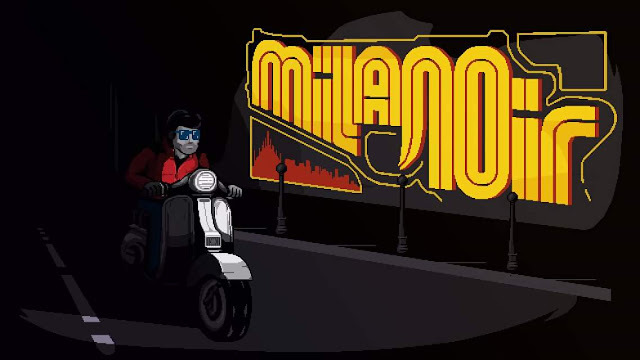 The game is a standard "move left to right" affair, with the most interesting mechanic being able to double jump by default and you gain momentum while running down a slope, which makes you invincible and enables you to kill enemies on impact, although this last comes up very rarely. The game has a lot of cool design features that help you feel like a tiny toy come to life traversing through an average modern home. 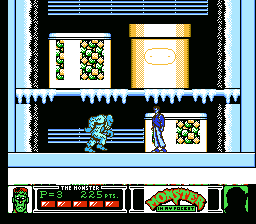 Many of the series 1 monsters can be found throughout the game, often ones that correspond to the current environment (such as the Bigfoot/Yeti boss that attacks you when you reach the freezer, shown above with frozen peas and carrots and ice cream). It's a fun game for fans of the toys because of all of the included figures re-created pretty accurately in sprite form. Unfortunately, that is where most of the fun ends. 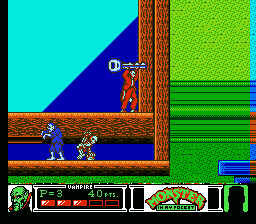 The game spams enemies at you at an alarming rate from the very first screen, and you suffer Castlevania style knock back whenever you're hit. Most ground enemies are easily avoided, and should be, but there are a lot of flying monsters that will swoop around you in a predictable pattern, but that doesn't make them any easier to avoid. The bosses might be the next best thing about the game, because they behave a lot like you expect them to(Yeti breathes ice that freezes you, spring heel jack jumps around and throws knives at you), and their patterns can be recognized and capitalized on. They're not the best or most enjoyable boss fights in 2d land, but they're at least fair in their challenge and rewarding to beat. You'll still see this screen a lot, but the game at least let you spawn at your death point when you lose a life, and enemies don't respawn once you've defeated them. 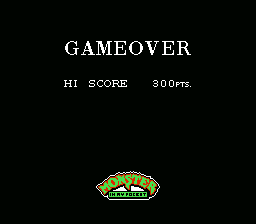 The biggest motivation to kill enemies that aren't a direct obstacle is to collect points, which when you obtain enough reward you with extra lives. Check in tomorrow for the continuation of Monster week. This game is why Pokémon wasn't called Pocket Monsters outside East Asia.